From Switzerland comes word of a technology for methanol synthesis plants which capture CO2 from the environment to create renewable methanol fuel. If you haven’t heard of it before, it’s appropriately named Silent-Power. The company produces both industrial and modular plants and is working to bring modular plants to private residences to empower individuals with energy independence. Now, you might have heard of the Methanol Economy — the legendary George Olah tipped that. At the Digest, we’re not a huge fan of “The (fill in the blank) Economy” scenarios. The Algae Economy, The Glucose Economy, The Fracked Economy, the Solar Economy. But, we’re a big fan of new alternatives that form a high-value section of a diversified energy and materials supply — especially one made from waste materials like excess ambient CO2. Whatever your feelings about the man-madeness or not of climate change, everyone agrees that atmospheric CO2 levels are higher than normal — it’s the one data point that is universally agreed. To some, that’s a problem,. To us, that’s a feedstock. And, while methanol fuel is traditionally produced from natural gas, it can also be synthesized using CO2 from the air, making it a renewable fuel. The urgency in Switzerland is more around renewable power than fuel, right now. In May of 2017, Switzerland voted to phase out the use of nuclear energy that powers a third of the nation, The first nuclear power plant is scheduled to cease operations by the end of 2019. Currently, just 4.3% of Swiss power generation comes from renewables – this will be ramped up from 2,831 gigawatt hours (GWh) to 11,400 GWh over the next 18 years. Switzerland has voted to phase out nuclear power and replace it with other sources of renewable energy. More than 58% backed the move towards greener power sources. But of course, what renewable technology is available in a cold, mountainous climate. Yes, intermittent wind and solar — but only to an extent. And, where’s the storage — so that renewable power can be used as base load? Grid-scale battery storage is not for the faint of heart or fain of wallet. Silent’s modular or “mini” Econimo power plants can generate this renewable energy source virtually anywhere and store the energy efficiently by locking it within methanol fuel. Further, these plants require only a few meters of space. 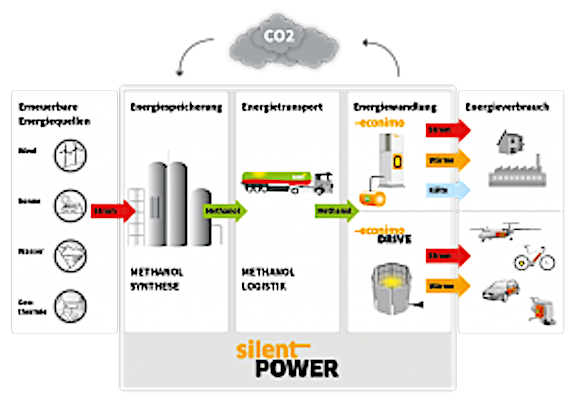 In 2016, the company won the “Swiss Innovation Award” for the production of CO2 neutral electricity from methanol and for the world’s first commissioning of a methanol mini power plant that could generate enough power for a residence of 45 persons. The mini power plants are called Econimo, take up only a few meters of space and can be placed just about anywhere. The plants produce no smoke, smell or dust particles and run at close to 80% efficiency. The current batch of Econimo units are producing 30kW of electrical power and 60kW of heat. Due to their lower carbon footprint, these combined heat and power systems are a recognized solution to curb CO2 emissions in power production, and are eligible for subsidies in certain jurisdictions, such as Germany. Of course, the fuel option too — and let’s not forget methanol chemistry. In June we reported that Enerkem is teaming with not just the Port of Rotterdam but also Akso Nobel and Air Liquide on a MSW-to-methanol plant at the port, where more than 2 million metric tons of MSW are imported annually. Akso Nobel is seen as a key offtaker of the methanol produced from the project as it looks to shift its raw materials away from fossil fuels while Air Liquide will supply the gases required for the manufacturing process. Air Liquide is expected to continue partnership with Enerkem as it expands into other projects around the world. In March we reported that researchers are looking to sugarcane bagasse to produce methanol, rather than ethanol, that could be used to power tractors. Uptake of the technology developed by the National Centre for Combustion Research and Development could reduce tractor fossil fuel imports by 15% and won’t create competition with the alcohol industry as ethanol does. Currently researchers are looking at how to convert the existing tractor fleet so they can run on methanol while the institute’s parent Indian Institute of Technology, Madras is in talks with sugar producers regarding demos and adoption. We summed up quite a bit of methanol-related activity in The rise, rise, rise of bio-methanol for fuels and chemical markets, and that’s here. Meanwhile, the Methanol Insitute has this slide deck we highlighted recently, An emerging alternative marine fuel: The Digest’s 2018 Multi-Slide Guide to Methanol — and that’s here. You will enjoy this look at harnessing Methane & Methanol as Feedstocks, that’s the subject of this overview of the uses of methanol when used by engineered platform organisms for fuel and chemical production. The background is the abundant CH4 and syngas supply — readily converted to methanol.